I had a Jazz Night Out adventure when I traveled to Bellefontaine, Ohio to see the John Scofield Quartet at the historic Holland Theatre. First of all, the theater is truly a one-of-a-kind gem that is well worth the hour-long drive from Columbus to experience. Built in 1931, its “Dutch atmospheric” style means that the interior of the auditorium is designed like a street in Holland, including building facades with lights, functioning windmills, and a night sky rendered on the ceiling with moving clouds! An old and innovative theater was the perfect setting for innovative versions of old music. The all-star quartet on stage was a delight, with guitarist Scofield, keyboardist John Medeski, bassist Steve Swallow, and drummer Bill Stewart playing some of Scofield’s favorite country songs, mostly drawing from Scofield’s new Country For Old Men as well as a few surprises. The band two played sets, often delivering traditionally-minded versions of the classic material, but occasionally ventured into noisier, more avant garde realms on a few pieces. While this element was present on the album, switching from Larry Goldings on the studio recording to Medeski in the live setting seemed to add to the more experimental direction. Medeski started the show on piano, with George Jones’ “Mr. Fool” kicking off the night featuring Scofield in a high and lonesome mode. The band’s take on Dolly Parton’s “Jolene” started with a swirling, dramatic intro reminiscent of “House of the Rising Sun,” and featured excellent solos, like Medeski’s weaving and wandering runs, Scofield’s nimble wailing, and a rambling section from Swallow. The bassist’s solo passages were eye-opening to me, as his low and textured tone on the electric bass was a sound I found unfamiliar but comforting at the same time. The middle of the show was likely the most “modern” portion of the evening, as the first set ended with Hank Williams’ “I’m So Lonesome I Could Cry,” and the second set started with Kenny Rogers’ “The Gambler.” With a humorously concerned intro from Scofield about the author’s thoughts on their version, the former produced a cloudy, detached haze, with long solos from Scofield and Medeski offering often abstract phrases. Rogers’ tune found a rainy day groove for its reworked melody, and the rhythm section played counterpoint to more accessible solos before an increasingly otherworldly conclusion. The rest of the evening found the band in calmer waters, with a plaintive, gospel-tinged Scofield leading an emotional arrangement of Jones’ “Bartender’s Blues,” and a reverent rendition of “Tennessee Waltz” painting the immortal tune in understated tones. It was a wonderful evening of country jazz played by living legends and enjoyed by a large crowd from all over, including the Columbus jazz scene, and I’m glad I got to experience it. Friday, October 14th (8 – 10:30pm): Jazz Brew Concert Series – Tim Dvorkin Trio and NexLevel at Whitehall Yearling High School. Jazz 98.5 FM, WSAX-LP and the SEMM Foundation continue their varied series of jazz concerts with a doubleheader of two of the area’s finest groups. NexLevel opens the evening with their sultry blend of smooth jazz, contemporary jazz, and funk, playing tunes from albums like recent release Midnight Blue. The Tim Dvorkin Trio will start around 9:30, featuring original jazz fusion material, including songs from 2016’s Live at Brothers Drake, and Dvorkin tells me you may hear a few standards as well. Tickets, which are $15 for adults, $8 for students, and free for seniors, are available here and at the door, and all proceeds support the pending official launch of the 24-hour Jazz 98.5 FM radio station. Support a great cause and enjoy top-notch live jazz! Sunday, October 16th (6 – 8pm): Richard Lopez Trio at Barcelona. Veteran pianist and educator Lopez will be busy sharing exquisite trio jazz at Columbus fine restaurants this weekend. After leading groups at Black Point in the Short North Cap Friday at 7:30pm and at Hyde Park Arlington Saturday at 7pm, he will end up Sunday at Barcelona, the German Village destination for Spanish fusion cuisine. Lopez will be joined by Matt Wagner on drums and Terry Douds on bass for an evening of enticing standards and surprises. No cover. Benjamin Franklin is famously quoted as stating, “There was never a good war, or a bad peace.” And yet, in 2016 America, there is all manner of evidence to the contrary. Does Franklin’s logic hold up in an America where large portions of its population live in occupied state conditions? “A Bad Peace” seeks to unpack that political duality in a unique performance of three brand new works by two of Columbus’ most progressive artists. Navigating the theme through poetry and song, Dr. Mark Lomax, II and Scott Woods will deliver a stunning collection of new work. 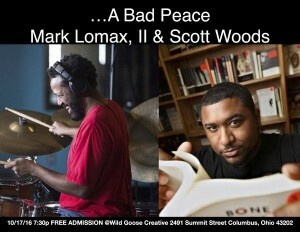 Dr. Lomax, II will be performing a new solo drum work, followed by Woods performing a new long-form poem. The presentation will conclude with a duet between the two that unpacks the history of black code-switching, jazz, and racial identity entitled “What You Smiling For?”, a multi-disciplinary work composed specifically for this event. A short Q&A follows the performance. Admission is free, and more information about the performers is available here.